OAPD Awareness Week at Dutchies! Come and be apart of a special intiative that is solely aided to raise funds for Overstrand Association of People with Disabilities (OAPD). OAPD is a special organisation based in the Overstrand Region that cares for individuals with disabilities. 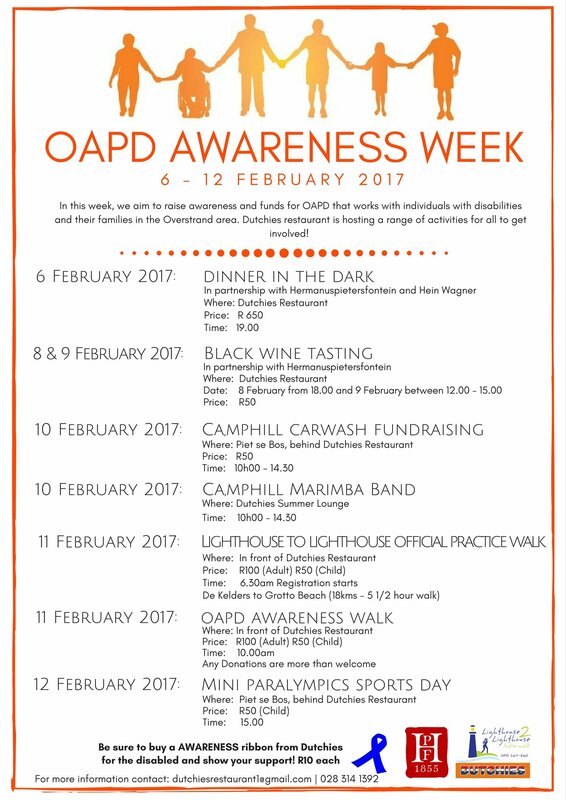 In collaboration with ‘Lighthouse to Lighthouse’, Hermanuspietersfontien and Hein Wagner; Dutchies will be hosting a week of Awareness for OAPD and Camphill Hermanus School. We challenge you to get involved and help a very worthy cause in your community!